Welcome to the fifteenth installment of Link Loves. These posts are all about my favorite links of the week! It can include bloggers, articles, news, clothing, accessories, and other cool links I’m enjoying. If you have a favorite blogger or article, share them with me in the comments! Welcome to the fourteenth installment of Link Loves. These posts are all about my favorite links of the week! It can include bloggers, articles, news, clothing, accessories, and other cool links I’m enjoying. If you have a favorite blogger or article, share them with me in the comments! Welcome to the twelfth installment of Link Loves. These posts are all about my favorite links of the week! It can include bloggers, articles, news, clothing, accessories, and other cool links I’m enjoying. If you have a favorite blogger or article, share them with me in the comments! Welcome to the eleventh installment of Link Loves. These posts are all about my favorite links of the week! It can include bloggers, articles, news, clothing, accessories, and other cool links I’m enjoying. CrapPile is blog that I just recently started following. John has quite an opinion on a lot of things which is something I can appreciate. His recent post on the Star Wars prequels caught my eye. As someone who loves the prequels (and even named her dog after Padme Amidala), I enjoyed reading what John had to say. I’m a huge fan of the blog The Time Ladies and its many writers. Thoughts on Regeneration: A Trans Perspective immediately drew me. Emma is a phenomenal writer and reading her post brought tears to my eyes; it’s a worthy read for anyone and everyone. Asiana Circus is another new blog I’ve added to my Reader! Like Jella, I found a place to call my own within anime. I also suffer from anxiety, and two of the anime shows mentioned were my escape: InuYasha and Ouran High School Host Club. Check out her list on Top Anime Shows that Help Fight Depression and Anxiety. 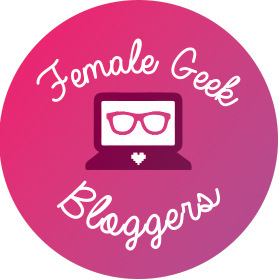 Girly Geek Blog’s very own Erin gives us A Week in the Life on Balancing Jobs and Blogs. What happens when life simply… happens? What can we do to properly balance real life jobs and chores with blog life and writing? Luckily, Erin gives us some tips! Ever wonder what your favorite blogger’s home looks like? Later Levels gives us a sneak peek of their home between furniture buying and construction. I personally can’t wait to see how this geeky home comes together! Welcome to the tenth installment of Link Loves. These posts are all about my favorite links of the week! It can include bloggers, articles, news, clothing, accessories, and other cool links I’m enjoying. Matt at Normal Happenings is re-watching the Star Trek movies and writing some phenomenal posts on his feelings behind them. This latest one on Star Trek IV: The Voyage Home definitely touched me as someone who is actively working on finding and being her better self. A new challenger approaches… Meet The Modern Gafa! Y’all know that even though Alec and I are married, our wedding is taking place in less than 5 months (que screaming and hair pulling). So when Modern Gafa shared this post on his wedding, I just knew I had to share it with you all! If you’re intestered in any other geek wedding ideas, check out these posts on engagement pictures and geek themed wedding items. It’s a rare occurance that a blogger gets featured twice on Link Loves but I loved both of these links! Matt at Normal Happenings is back with Writing the Unreliable Perception of Time with some insight to his main character in Dysontopia. Which I love in case you didn’t know! And now for something I think you’ll really enjoy… Well, maybe if you’re a graphic designer you will! Spoon Graphics is an awesome site with tons of tutorials and free stuff! I’ve referenced back to his tutorials for my branding boards as well as things here on the blog. This glorious bag has my name written all over it. I am in love with it’s design. I would wear this on a t-shirt.